Saudi Arabia is pitching a sweeping plan to raise 1.6 trillion riyals (US$425 billion) for infrastructure and industry across the world’s leading oil-exporting nation. “It’s about diversification, it’s about private sector partnership, it’s about government-focused spending which we’ve determined to do over the next few years,” Economy and Planning Minister Mohammed Al Tuwaijri told Bloomberg Television. Saudi Arabia has “developed a few scenarios” for how to split spending between private investors and the state, he said, declining to give details. Saudi Arabia is getting a makeover under the crown prince, who assumed his de facto leadership in 2017 vowing to steer the economy from its near-total dependence on crude by masterminding reforms known as Vision 2030. The kingdom’s infrastructure -- from roads to water supply -- was ranked 40th among 140 nations in the World Economic Forum’s latest Global Competitiveness Report. But while higher public spending is projected to drive non-oil economic growth to 2.6 per cent in 2019, the pace remains below levels achieved before 2014, when crude prices collapsed, according to Bloomberg Economics. The share of the government’s oil income will grow to 68 per cent of total revenue this year. 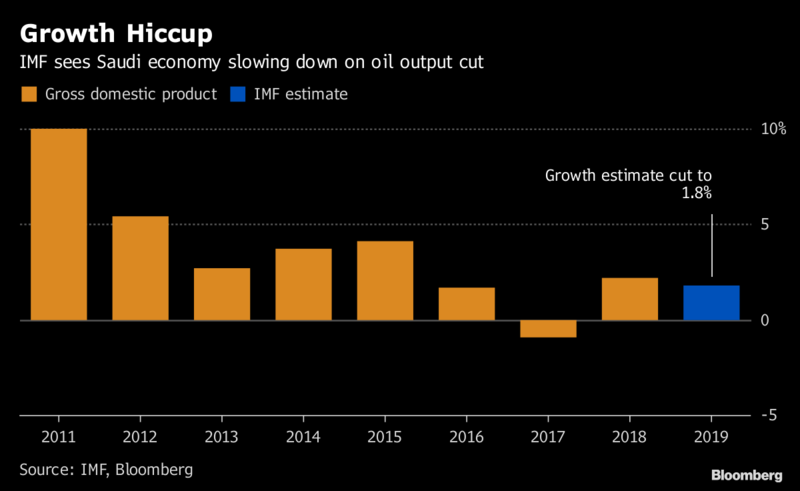 With Saudi Arabia finding it harder to continue pumping fiscal stimulus into the economy, the infrastructure push will test investor faith after the killing of Jamal Khashoggi sparked global outcry. Al-Falih has said the program is expected to contribute US$320 billion to the Saudi economy by 2030, equivalent to almost half of the country’s gross domestic product last year, and create 11 new industries from aerospace to biomedicine. The kingdom is planning to boost expenditure this year by 7 per cent, basing this year’s budget on an oil price estimated by Bloomberg Economics at as high as US$80 a barrel. International benchmark Brent crude closed below US$62 in London on Friday.